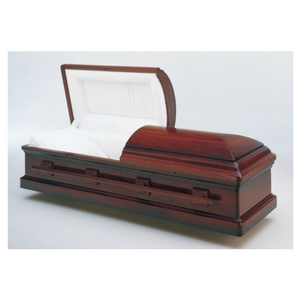 Wooden caskets offer a classic look that is often completely unique, and the selection of earth tones offered by the material is nothing short of heartwarming. Just like any casket, the models feature both half-couch, and full-couch lids, and are adorned with gorgeous interior bedding, often made of crepe or velvet. The exteriors offered are finished to show the natural patterns in the wood, or may even be lacquered for a bold, rich tone or glossy shine. The traditional handlebars offer ease of handling, and the perfect final touch to what will be a befitting final tribute to a truly loved individual. A metal casket are elegant, durable, and protective on the outside with automotive finish and shiny accents. Most metal caskets are designed to survive the elements for as long as possible. 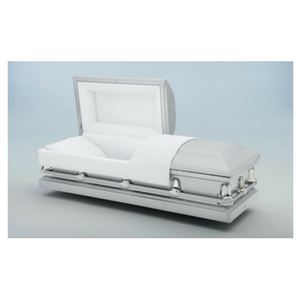 Metal caskets continue to be the most popular type of casket available. Their renowned durability proves, year after year, to be a great comfort to loved ones.